1. I put on shorts when I got home; the girls were outside playing. Thanks goodness that Spring may have finally arrived. 3. I completed two minor room decor updates in the house--both super nerdy in nature. A.) I bought a frame so that I could give Grace a wall-worthy version of a recent Entertainment Weekly cover. Since Sarah recently got furniture upgrades in her room; and since the old furniture was passed down to Hannah's room, I thought that Grace deserved a small piece of something new. And since she started watching Doctor Who before Sarah, I thought she would like it. B.) 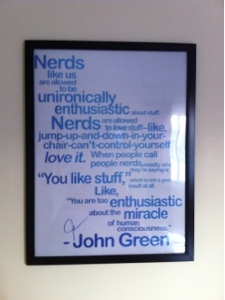 I also framed the John Green poster that I had purchased back before Christmas. So while I was at the store for the other frame, why not get another one as well? But once home, where to hang it? I thought that it would most likely end up in the basement--and when Lynda asked where I thought we could hang it, that is what I said. But she (to her enormous credit) said, "No. I mean half of the people in this house are nerdfighters, so don't hang it in the basement." Isn't she awesome? So, it is hanging in the TV room, on an opposite wall from the Tree of Gondor quilt. BEDA 4: That Witchcraft That You Do . . .
Blogging Every Day in April?